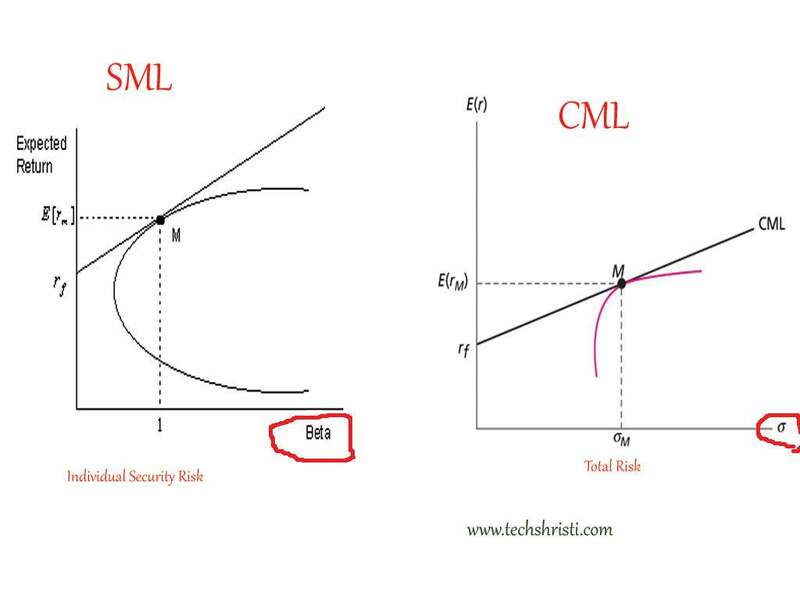 CML stands for Capital Market Line, and SML stands for Security Market Line. Capital market line is the tangent line drawn from the point of the risk-free asset to the feasible region for risky assets, that is it is a upward sloping line drawn from Rf to connect different portfolio points where as Security market line displays the expected rate of return of an individual security as a function of systematic, non-diversifiable risk, that is it is a upward sloping line fron rf that connect different security points. CML is based on total risk that is Standard deviation where as SML is based on beta that is non diversifiable (Systematic) risk. CML is a upward sloping line from rf based on total risk that is relationship between Expected return and total risk. SML is upward sloping line from rf based on beta that is relationship between Expected return and beta of security. If you have any problem related to this both term then feel free to contact us.Remembers at some place instead of using finance jargon we have used simple language.The purpose of using simple language is to make you understand the concept,you must have to prepare the defination from your text book from exam view point. Check out this video for further in depth explanation.Same thing is explained in detailed.